President Barack Obama, like his Party and his Socialist Ideology, has sunken into the morass of moribundity in twelve short months in total power. Interestingly impressive feat for a Party, a President, a Congress, a US Justice Department, a Homeland Security Administration and an Ideology after just one little year in office. Sooo… what would Hugo Chavez or Fidel Castro or Mao Tse-Tung do? …in this kettle of fish with their first State of the Union looming large as President of the United States in a mid-term election year after Massachusetts sends in a Conservative Republican as a replacement for deceased Uber-Liberal Ted Kennedy? Substitute a State of the Union speech for a partisan campaign speech to repair the Smeared Lipstick on Socialism, freeze-define-attack Faux Private Sector (Banks) Dragons, and redirect blame for a failed Obama first year from himself to who else? George Bush and so-called ‘Astro-Turfing‘ bitter bible carrying gun hugging Americans , of course! Why… all America needs to get it’s feeble mind right is a better Teleprompted Computer Precision Presidential Speech! Right? I am sooo glad I am not in Obama’s shoes… his left wing base did not get him over the finish line in 2008, the independent swing voting taxpayers did, throwing in their lot with Obama on the basis of Hope and Change. Did Obama & Co deliver on that theme? designed to un-stimulate the private sector vitality in favor of growing the public sector with borrowed money? 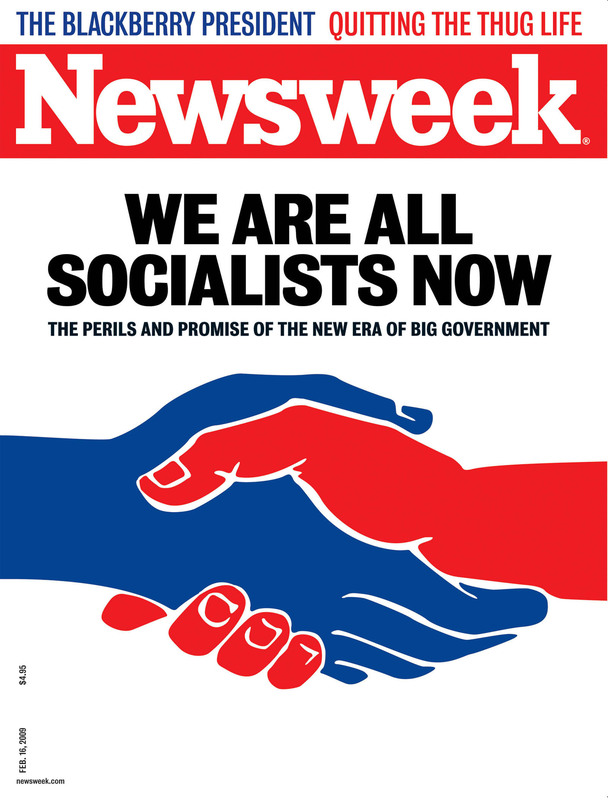 Will the Socialists go down in the 2010 mid-terms like the Hindenburg? The Sham Wow Party is going down! Hillbuzz: STUNNING ADMISSION: UK scientists admit they make up data for political reasons to support Church of Global Warming and Question of the Day: Which races should we follow in 2010? and The Illinois Sente Race and Monday Open Thread: January 25th, 2010 and Who is Sean O’Sullivan and what web sites does he run? Sister Toldjah: Astroturfing campaign underway by Team Obama? LisaInTX: Some News on Israel: Interesting point of Views regarding Zion and Progressives: MLK was a RADICAL SOCIALIST?? OMG? and Should Presidental interpretation “supersede” judical court rulings? WarrantOneGirl: Obama to grant TPS (Temporary Protected Status) to undocumented Haitian immigrants-(Temporary?) Another Lie and Apostle Claver tells the world how the real party of racism is the Democrats and Progressives: MLK was a RADICAL SOCIALIST?? The Left IS Dillusional! This entry was posted in Obama and tagged Barack Obama, Communism, Congress, Conservative Blog Network, Democrats, liberalism, ObamaCare, Sarah Palin, Scott Brown, socialism, State of the Union, The Sham Wow Party. Bookmark the permalink. I cannot wait till Wednesday to watch Obama deliver the kiss of death speech that will serve to only further infuriate the American People. This Presidents Ego is writing checks his body can’t cash. Worst US President in history already and he just keeps digging that hole deeper and deeper. Guess he has nothing better to do with all those shovels he promised the American People. The idiots can’t even get their lies straight. Good Morning Tellit. Good to see you my friend. The will be a presidential news black out at my house Wednesday. No bama TV. Good to see you my friend! How are you? Did you notice that suddenly all the Obama supporters have gone into hiding. Check out the photograph on this link. The idiot can’t even talk at an elementary school with out bringing his teleprompters. The contract, awarded on Jan. 4 to Checchi & Company Consulting, Inc., a Washington-based firm owned by economist and Democratic donor Vincent V. Checchi, will pay the firm $24,673,427 to provide “rule of law stabilization services” in war-torn Afghanistan. The legality of the arrangement as a “sole source,” or no-bid, contract was made possible by virtue of a waiver signed by the USAID administrator. “They cancelled the open bid on this when they came to power earlier this year,” a source familiar with the federal contracting process told Fox News. Contacted by Fox News, Checchi confirmed that his company had indeed received the nearly $25 million contract but declined to say why it had been awarded on a no-bid basis, referring a reporter to USAID. Asked about the contract, USAID Acting Press Director Harry Edwards at first suggested his office would be too “busy” to comment on it. “I’ll tell it to the people in Haiti,” Edwards snapped when a Fox News reporter indicated the story would soon be made public. The USAID press office did not respond further. Rep. Darryl Issa, R-Calif., the ranking Republican on the House Oversight and Government Reform Committee, said Fox News’ reporting on the no-bid contract in this case “disturbed” him. Issa has written to USAID Administrator Rajiv Shah requesting that the agency “produce all documents related to the Checchi contract” on or before Feb. 5. Citing the waiver that enabled USAID to award the contract on a no-bid basis, Issa noted that the exemption was intended to speed up the provision of services in a crisis environment. Corporate rivals of Checchi were reluctant to speak on the record about the no-bid contract awarded to his firm because they feared possible retribution by the Obama administration in the awarding of future contracts. Still, the rival executive confirmed that open bidding on USAID’s lucrative Afghanistan “rule of law” contract was abruptly revoked by the agency earlier this year. Those remarks echoed an earlier occasion, during a candidates’ debate in Austin, Texas on Feb. 21, when Mr. Obama vowed to upgrade the government’s online databases listing federal contracts. The March 4 memorandum directed the Office of Management and Budget to “maximize the use of full and open competition” in the awarding of federal contracts. Federal campaign records show Checchi has been a frequent contributor to liberal and Democratic causes and candidates in recent years, including to Obama’s presidential campaign. The records show Checchi has given at least $6,600 to Obama dating back to March 2007. The contractor has also made donations to various arms of the Democratic National Committee, to liberal activist groups like MoveOn.org and ActBlue, and to other party politicians like Sen. John F. Kerry, former presidential candidate John Edwards and former Connecticut Senate candidate Ned Lamont. Sources confirmed to Fox News that Checchi & Company is but one of a number of private firms capable of performing the work in Afghanistan for which USAID retained it. For example, DPK Consulting, based in San Francisco and with offices in Washington, D.C. and elsewhere, states on its website that it has contracted with USAID and other federal agencies on more than 600 projects involving “governance and institutional development” across five continents. Among DPK’s most recent projects are the establishment of a new public prosecutor’s office in Jenin, in the troubled West Bank area of the Palestinian Authority, and the improvement of court facilities in the Kyrgyz Republic in Central Asia. Similarly, BlueLaw International, based in Virginia, was awarded a $100 million contract by the State Department in April 2008 to strengthen the “rule of law” in Iraq. Although Obama suggested in his remarks on March 4 that he hoped particularly to address problems associated with defense contracting, an Associated Press analysis last July found that the Defense Department frequently awards no-bid contracts under the aegis of the $787 billion stimulus program, and often at higher expense to U.S. taxpayers. According to The AP, more than $242 million in federal contracts, or roughly a quarter of the Pentagon’s contract stimulus spending, was awarded through no-bid contracts. And while procurement officers say competitive bidding can actually cost the taxpayers more — because it involves delays and can thereby subject pricing for services and equipment to inflation — the AP analysis found that defense-related stimulus contracts awarded after competitive bidding saved the Pentagon $34 million, compared with $4.4 million when no bidding was involved. Figures kept by OMB Watch, a non-profit research and advocacy group that tracks federal spending, show that no-bid contracts have been common under administrations controlled by both parties. During fiscal years 2000 and 2001, for example, when Bill Clinton was president, as much as $139.2 billion in federal contracts was awarded without competitive bidding. The OMB Watch figures show that the practice appears to have accelerated sharply during the Bush administration, but the figures are not adjusted for inflation. I listened carefully this morning to David Axelrod’s discussion on ABC of the “lessons” that the Obama Administration has learned from Massachusetts. One lesson he said they’d learned is that “people don’t want us to walk away from health care.” Which is surprising, because I had been under the impression that one of the main things we learned from the debacle was that people hate our current approach to health care reform. This is not so, says Axelrod. Au contraire, “the bill that the House and Senate passed were patterned in many ways on the Massachusetts health care plan,” and 68% of the people who voted said they favored the Massachusetts plan. When I heard that, I thought: this guy Axelrod is going beyond spin. He’s downright dishonest, if only with himself. One of the great disasters of the current health care reform is that it will leave several of the most loyal Democratic electorates in the nation–Massachusetts being only one–WORSE OFF THAN BEFORE. Massachusetts is worse off because its current plan covers 97% of its residents, and the new plan would not do nearly as well and would cost even more. Governor Howard Dean has eloquently argued that the current “reform” will leave the people in his own state of Vermont WORSE OFF than they are now with the nearly universal coverage that was passed during Dean’s tenure. Out here in San Francisco where I live, we have what is called “Healthy San Francisco” which ensures that even the poorest of the poor can obtain any needed health care services. This program would simply disappear under the new reform. The underlying elements [of the bill] are popular and important, and people will never know what’s in that bill until we pass it, the president signs it, and they have a whole range of new protections that they never had before. In other words, stop carping, trust us, you’ll love it. When the president walked in the door he was handed the worst economy since the Great Depression. Axelrod shared some of the sage advice he had given Obama when he first came into office. He said he told the new president that his numbers were not going to look nearly as good in a year due to the economic catastrophe he was inheriting. Again the honesty question. Mr. Roosevelt swept into office as an enormously popular figure whom voters had entrusted to rescue them from a financial catastrophe that some worried could threaten America’s democracy. By the time Mr. Roosevelt took office in March, 1933, many of the nation’s banks were on the verge of collapse or shut down. But what Mr. Axelrod seems unfamiliar with is the subsequent trajectory of FDR’s popularity as he proposed and then enacted his New Deal. His popularity soared and within a year was at 80%. How come FDR was adored and Obama is increasingly reviled? Let me suggest a few points for Mr. Axelrod to ponder before he gives the president his next round of advice. Mr. Roosevelt, like Ronald Reagan a half-century later, figured out how to go over the heads of Congress and appeal directly to the public. President Obama’s enormous popularity gave him a chance to do this as well, but he unfortunately surrounded himself with hacks like Axelrod and Emmanuel and tringulated instead toward some mythical centerground. Practices of the unscrupulous money changers stand indicted in the court of public opinion, rejected by the hearts and minds of men…The money changers have fled from their high seats in the temple of our civilization. FDR’s immediate task upon his inauguration was to stabilize the nation’s banking system. On March 6, Roosevelt declared a national ‘bank holiday’ to end a run by depositors seeking to withdraw their money from faltering banks. FDR also called Congress into emergency session where the legislature enacted, nearly sight unseen, the President’s banking proposal. Under this plan, the federal government would inspect all banks, re-open those that were sufficiently solvent, re-organize those that could be saved adn close those that were beyond repair. Obama’s response was different. His first act, effectively, was to approve a direct $787 billion taxpayer bailout of the banks. Axelrod said Obama had to do it to avoid another Great Depression. But what is really depressing is to look at the difference between what happened to the economy after FDR’s emergency bank legislation and what happened to the economy after Obama’s huge bailout. In 1934 the American economy almost immediately began a long-term recovery from the depression. In 2009 after the bailout the American economy continued to sputter along. We love Obama, if only he could let out his inner FDR. We thought he was going to be a champion of the middle class and the oppressed, but it appears instead he has become captive to hack political advisers who have forgotten the lessons of history and the ways that a president can use tremendous popularity to gain even more popularity as a champion of the people. At the end of Barack Obama’s worst week since taking power a year ago, the US president’s fortunes look set only to deteriorate over the coming days. Following the shock defeat of the Democratic candidate in Massachusetts on Tuesday, a move that deprived the president of his 60-seat super-majority in the Senate and left his legislative agenda in tatters, Mr Obama has just four days to reboot the system. The US president had originally delayed next week’s State of the Union address to Congress in the hope he would get his signature healthcare reform bill enacted in time. That prospect, already waning, was killed dead by the voters in Massachusetts. A growing number of Democrats believe the nine-month effort could collapse altogether. However, even a more modest agenda looks tough for Mr Obama now. Believing their strategy of total opposition was vindicated by the voters last Tuesday, Republicans are in even less of a mood to co-operate with Democrats than before. The difference is that with 41 seats in the Senate they are in a position to block almost anything Mr Obama proposes – including the Wall Street regulatory measures he announced on Thursday. Nor can Mr Obama rely on unity within his own party, which has been in disarray, if not panic, since Tuesday. For example, Mr Obama’s more populist tack on Wall Street re-regulation failed to attract endorsement from Chris Dodd, chairman of the Senate banking committee, even though he was present when Mr Obama made the announcement. Others, such as Tim Johnson, Democratic senator for South Dakota and a senior member of the banking committee, were already opposed to elements of Mr Obama’s regulatory proposals including the plan to establish a consumer financial protection agency. Finally, there is increasingly open Democratic disaffection about the way Mr Obama is managing relations with Capitol Hill. Many believe that Rahm Emanuel, Mr Obama’s aggressive chief of staff, served Mr Obama badly by persuading the president that his election was a transformational moment in US politics that gave him the opportunity to push through long-cherished Democratic goals, such as healthcare reform. In fact, exit polls from Mr Obama’s election showed that almost two-thirds of the voters cited the economy as their chief concern, with fewer than one in 10 mentioning healthcare. Mr Emanuel is also perceived to have mishandled the day-to-day logistics of getting healthcare through Congress. By leaving the scripting of the details of the healthcare bill to Democratic leaders on Capitol Hill, the White House openly courted the risk of chaos. Tellingly, in his victory speech in Boston on Tuesday, Scott Brown, the new Republican senator, cited voter disdain for the sight of lots of “old men” on Capitol Hill bickering over healthcare reform at a time when their priority was jobs. Good Morning Mr Tell It Like It Is! Good morning VF! How are you? Here’s one for Barney Frank! I had some debate over at CNN on saturday and honestly they were absolutely at a loss for words. One woman even insisted that there never has been nor will there ever be Socialism in this Country. They stayed off my post all day yesterday and nothing from the frothy Libs today either. Obama has now officially proved us all Right. VF I really like the Picture up on this post and the certainty of all you have to say in it. We need to have a SOTU party Wedensday. Sam, what post? Do you have a new post on Icry? See y’all later….hope y’all will take time to read my latest post….just when I’ve been called it all, a NEW ONE gets thrown on me!! I am using Face Book @CNN. Love the photos!! 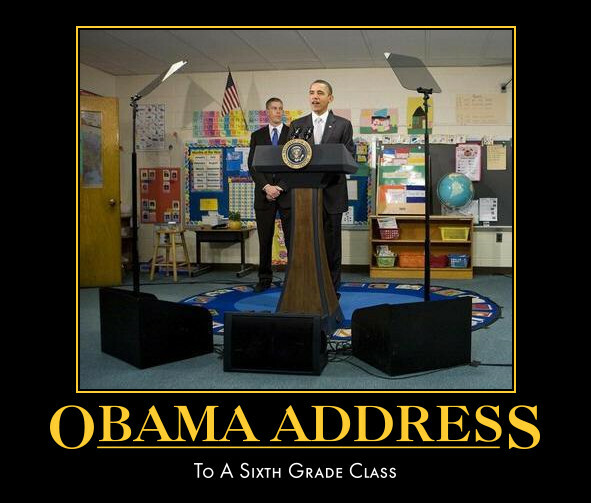 LMAO…..especially the 6th grade class…..that is what he thinks of ALL Americans! According to his idea, we are just too DUMB to GET IT! I think We The People KNOW FULL WELL what he wants and we say HELL NO! Now what part of THAT does HE not get? He is totally CLUELESS! I used this Disclaimer over at CNN when the name calling started coming from the libs. I believe it was Robert Gibbs that said his use of the teleprompter was “his style”. I’m copying that one Sami… I like it! and you got that right about Obama’s opinion of Americans who oppose him. Tellit said: Did you notice that suddenly all the Obama supporters have gone into hiding. No, not really. Everytime I see and Obama sticker I pull up and stare at them.